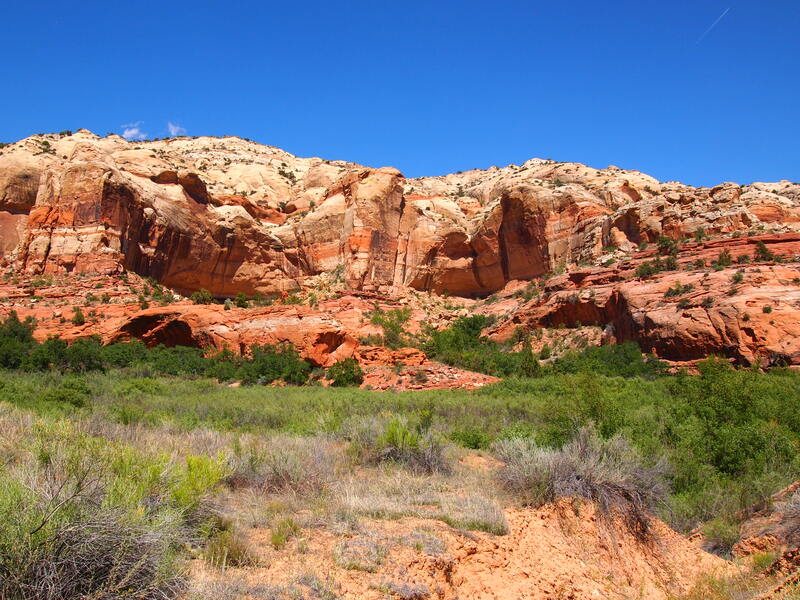 Since we spent Sunday morning hiking on Boulder Mountain, we only had time to do one hike in Grand Staircase-Escalante (GSENM). 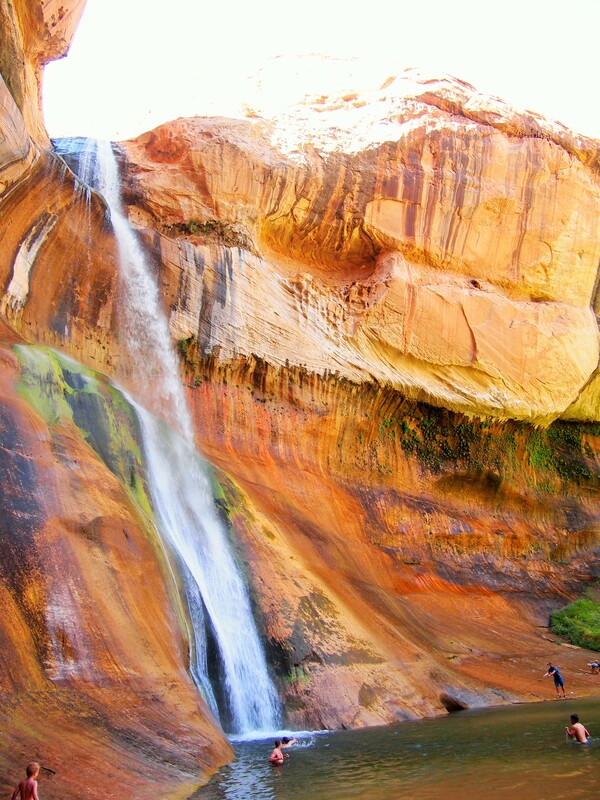 We chose to do Lower Calf Creek Falls on the recommendation of a colleague of mine. 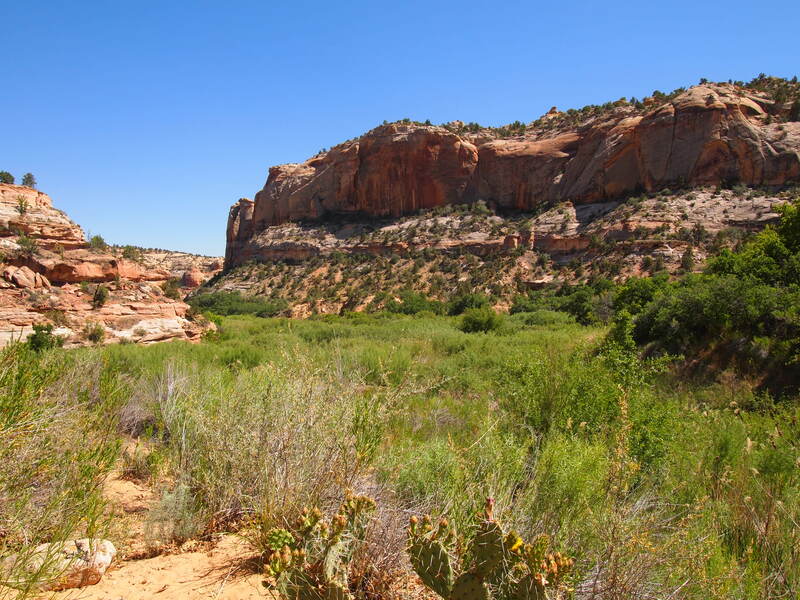 The hike is 6 miles RT – not a loop unfortunately – and located just off Byway 12. We decided to grab lunch in Boulder first and do the hike in the afternoon. 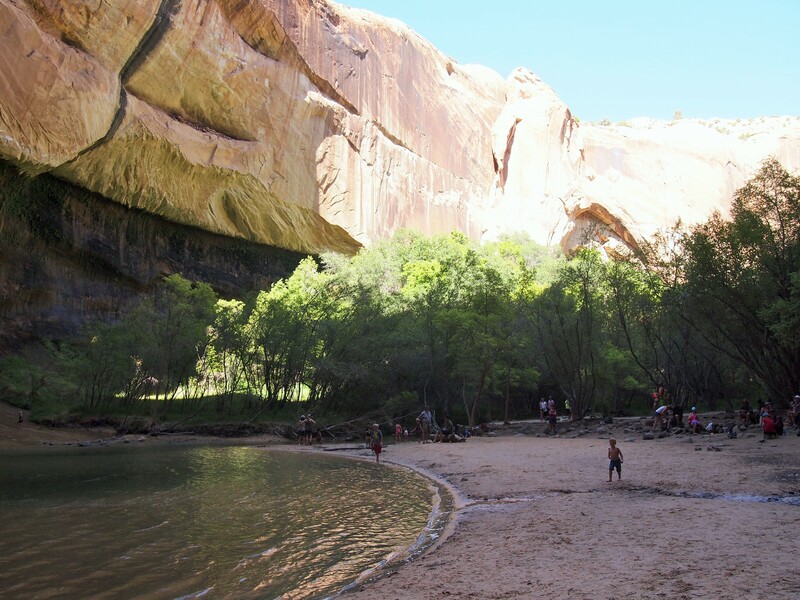 As it turns out, Lower Calf Creek Falls is one of, if not the most popular hike in GSENM. 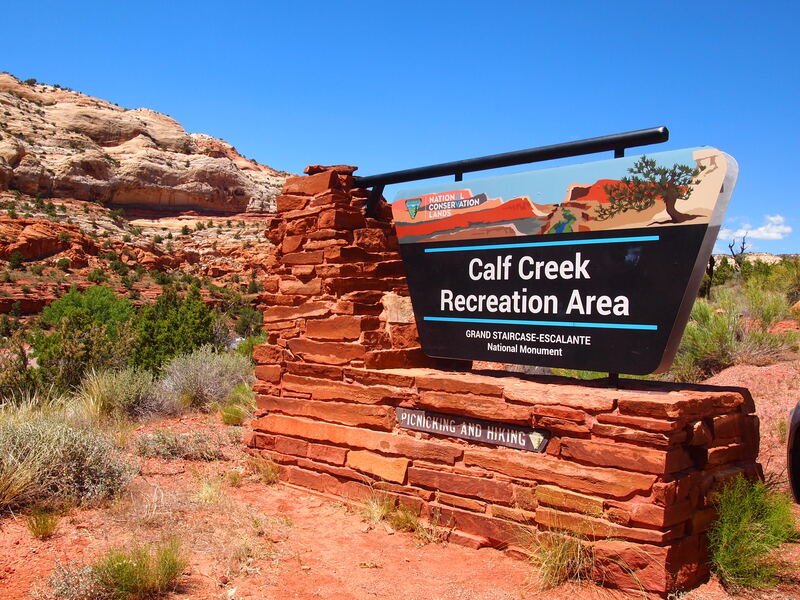 Its relative ease, accessibility, and stunning conclusion make it a destination for families, hikers with dogs, families with dogs, older visitors – literally anyone who can walk. Though it is on the longer side at 6 miles, the elevation gain is minimal making it pretty easy. 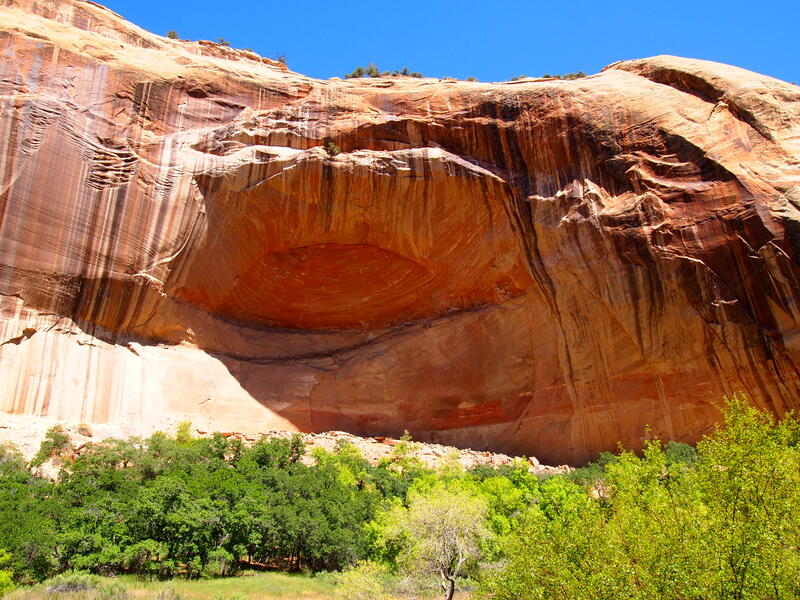 There are a few spots where you have to climb up and down slickrock but there isn’t any scrambling involved. All in all, if you can walk 6 miles, you can do it. 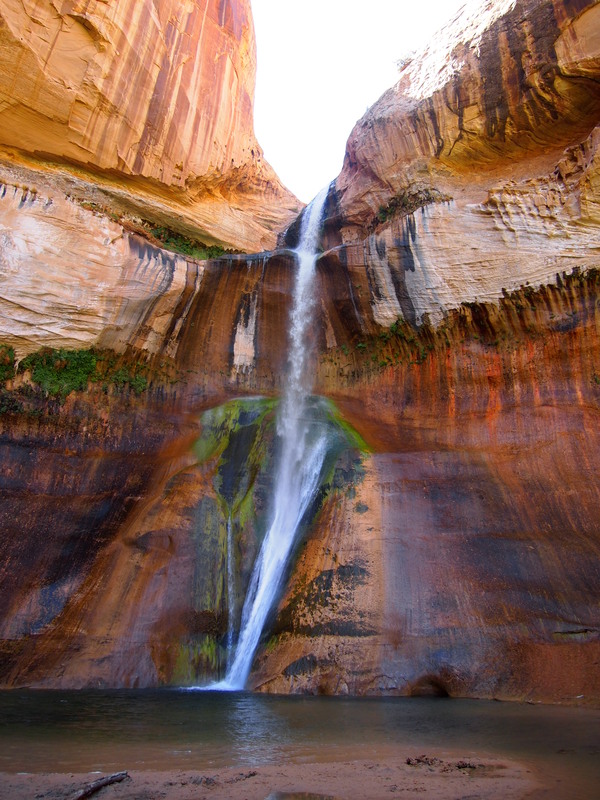 Lower Calf Creek Falls showcases a different side of GSENM. 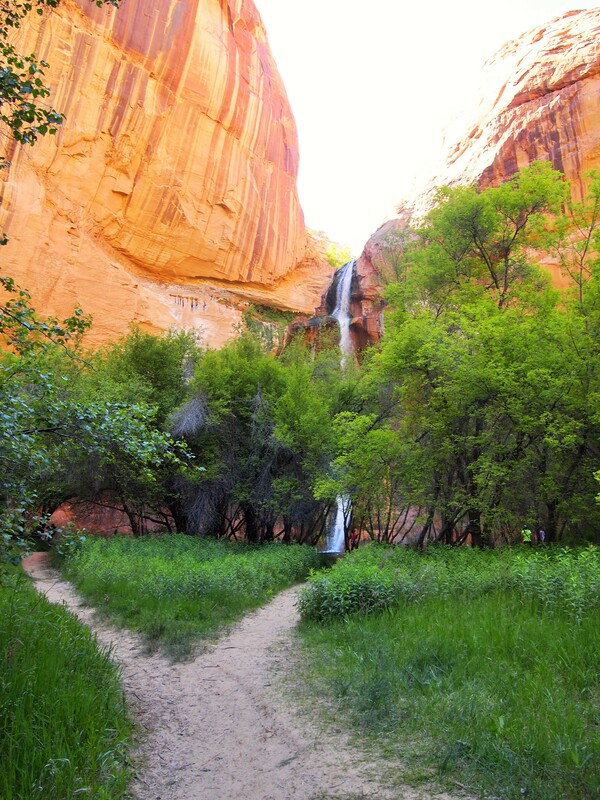 Here you see the life-giving force of water as the trail skirts the lush canyon floor along Calf Creek. 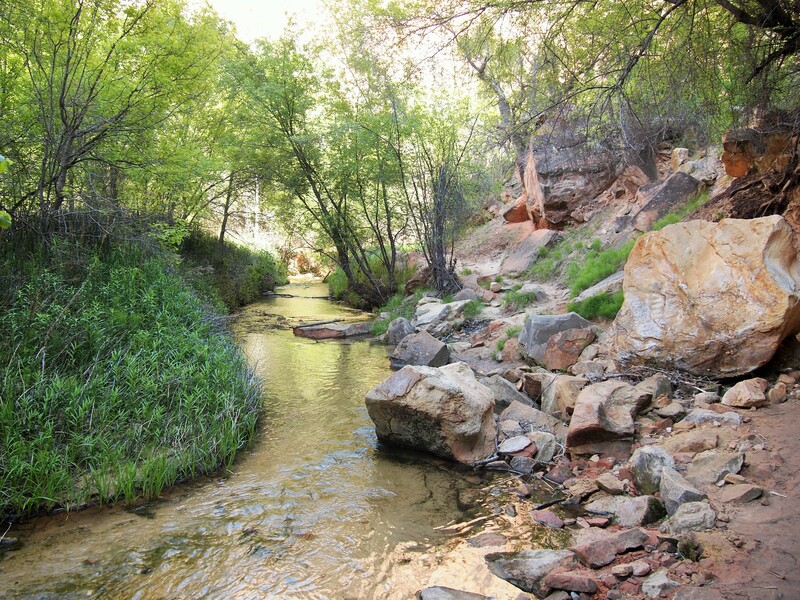 Although the trail doesn’t directly follow the creek, its presence is evident. 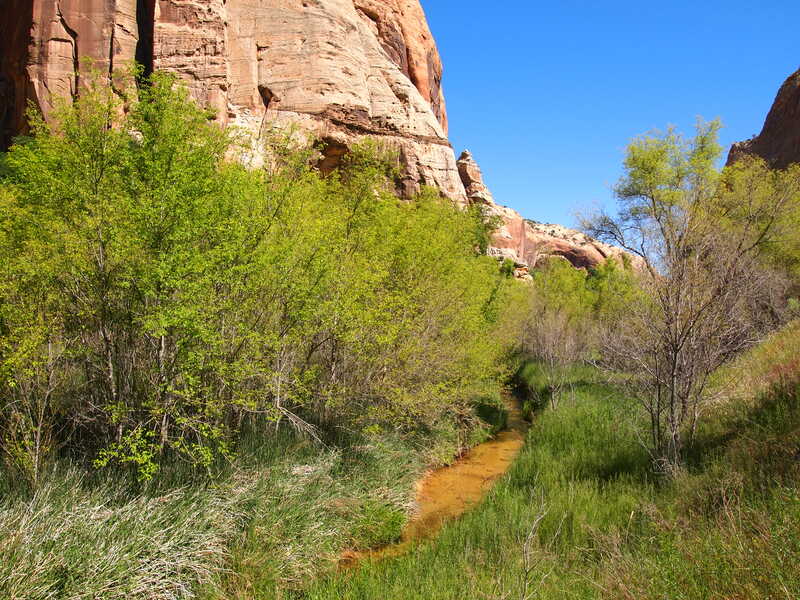 The vibrant green of the plant life around the creek was beautiful especially against the varying red hues of the canyon walls. Combine that with a bluebird sky and it was hard to take a bad photo. With that said, much of the trail is exposed; you aren’t trading a day in the sun for a day in the shade. Thankfully, we had a couple things going for us. We began our hike around 2pm – during the peak of the sun’s heat, yes – but since we were heading northwest, the sun was mostly at our backs as we hiked to the waterfall. As we hiked back out, the sun’s glare had shifted and was kept mostly behind the canyon walls giving us fairly shaded 3 mile journey back. The hike itself wasn’t my favorite. 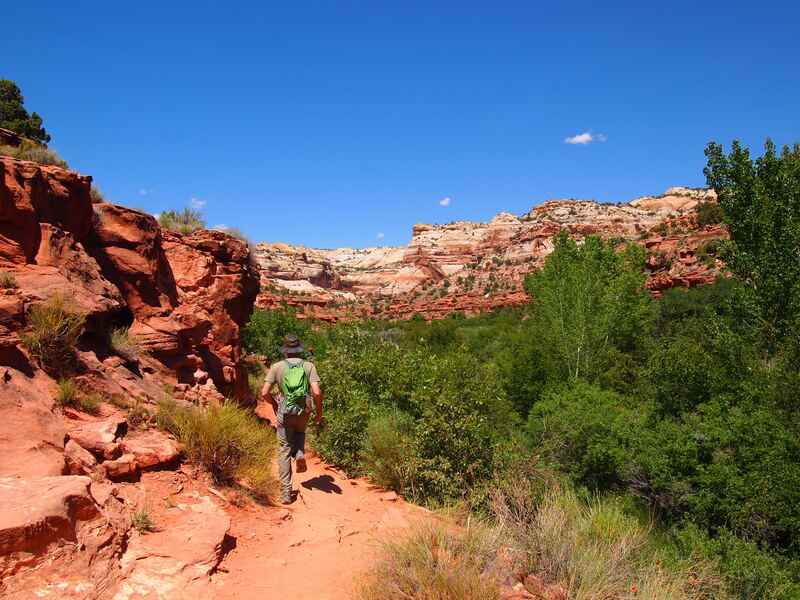 At the beginning much of the trail snakes up and over slickrock but when the trail brings you to the canyon floor, it becomes sand, a deep irritating sand. 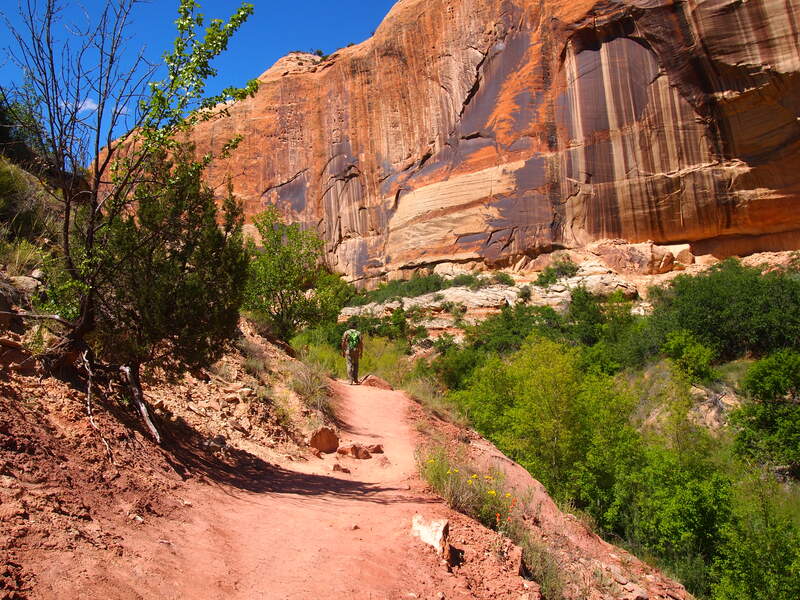 There are a few points where the trail hardens, but for the most part you end up walking on a narrow sandy path. 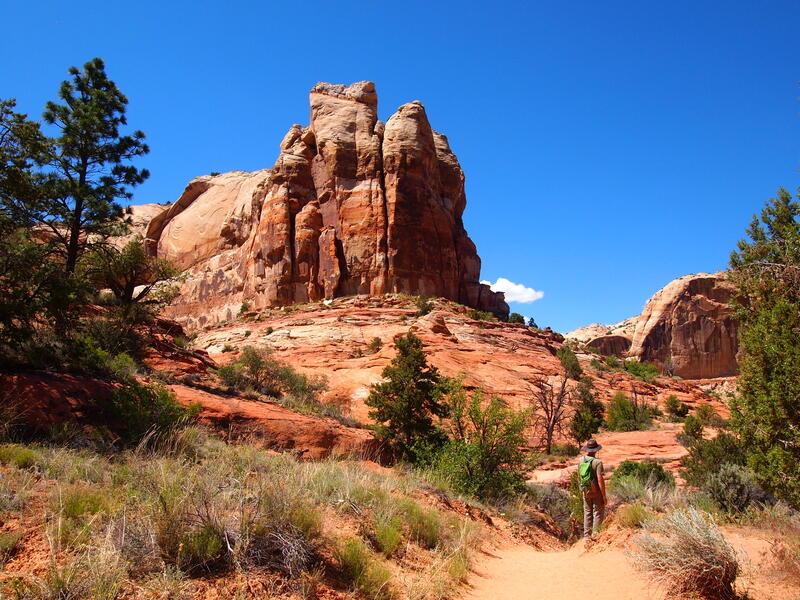 We were also there on Memorial Day weekend, so I’m sure we had to contend with more visitors than usual, although from what I understand any weekend brings multitudes to this trail. While the allure of the waterfall at the end kept my spirits up on the initial 3 mile journey, by the time we were in the 5th mile, I was ready to be done with this hike. 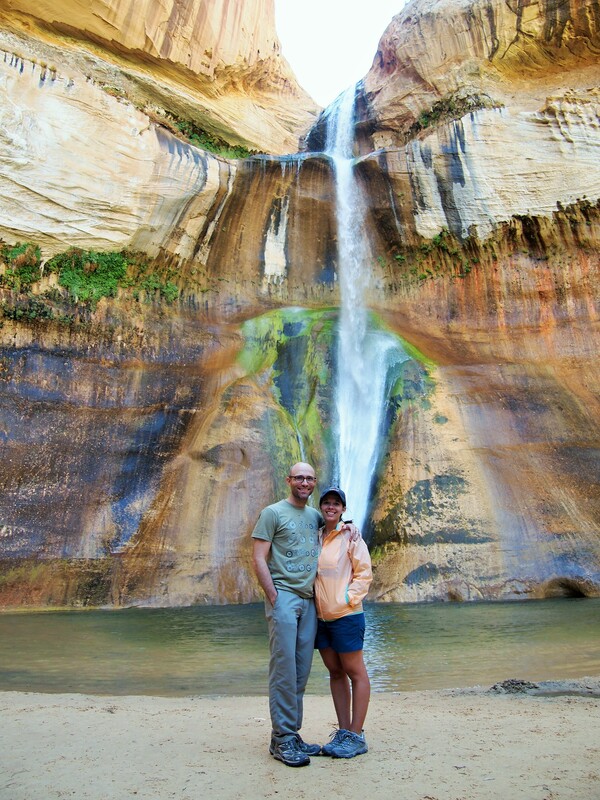 I will give this hike credit where it is due – the 120 ft. waterfall at the end is quite a stunner.